The pressure is very low on mars. If you were to step out of your space suit your blood would literally boil. In winter the climate can get as low 92º Fahrenheit. The average temp on mars -80ºF. The atmospheres very thin and the ice caps it can get up to negative 252º. As I was saying the atmosphere is very thin it is 100 times thinner then earths. At times it even snows but it is not like earths snow it is carbon dioxide. There is lots of dust storms on mars and in the storms there is rust and if you breathed that in you would die almost immediately. Several studies have shown that there is abandonment water ice under the surface. Also there may be life under ground mars along with flowing water. We are all from different countries and have different cultures. We don't have a set religion, we will let people practice their own religion during their free time, or if it has a set time than that is okay. But we will vote on all religious rituals if they would be border line okay, or pose a potential threat. Everybody speaks English and the language from their homeland. We will be a very diverse crowd because we are all from different countries. But we will all try to get along. We will eat a lot of rice and vegetables because they are very common, but also we will occasionally make special dishes from the countries, if we have those ingredients. So Mars' terrain is very different from Earth's, Earth's terrain can change very quickly but on Mars the terrain is mostly unchanging. Rocky and dry, Mars' terrain has caused several problems for roves such as the Curiosity. Mars also has some very extreme landmarks, such as Olympus Mons which is three times the size of Mt. Everest and it's deepest crater is 9 kilometers deep. We decided that we shouldn't do most of our drawings online because we wanted to get creative and get our imagination to grow. For our 2 dollar bill, one of our members of this group drew Kobe Bryant because last night, Kobe Bryant retired and we wanted to honor him by putting him on our $2 bill. Our theme was things that would make people laugh and we think we did a good job. Like for the $20 bill we put Michael Jackson instead of Andrew Jackson. Get it? For our $1 bill, one of our members did a cat because they like cats. For our $50 bill, we did Bill Clinton because most of the members in our group decided that he was the best president. For our $5 bill, one member did Shrek because he really like him as cartoon character. For our $10 bill, one of our members drew Sanik because he is a funny character. For our $100 bill, one of our members drew Mickey Mouse because most of the people in this group really like him. For our most rarest bill, we put a picture of our class because we all are going to Mars and we want us to be on it. And for our 5 cent change, we put a smiley face because it was funny. We really enjoyed doing currency for Mars because it was really fun and most of us liked doing it! Whatever happens never lose hope! Mars! Mission! Hope! First we, read some tips on creating a national anthem. It told us to make it in the tune of a popular song. So then we thought what songs are popular right now, we narrowed it down to two songs, My House and little Einsteins remix. We decided to go with little Einsteins remix, we thought that people would like it more and it would be funny. As for the lyrics we decided that we should first talk about the journey to Mars, then about the terrain and climate on Mars, next we would include the innovatio motto, then last we would feature some thing about innovating which in Latin is innovatio. We practiced as we went and after we finished writing our national anthem, and finally we recorded it. Writing the national anthem was a very fun and exciting responsibility. We collaborated really well and had so much fun with this project. Mainly to travel to different countries, passports are very important and carry almost all of you personal information (except for your secrets). The passport that we have made is in black and white and holds some of your personal information. Some of the information it holds is your name, gender, age, home country, your picture, small description of yourself, and your signature. The passport is very important for your journey, without it you would not be able to go there. Passports allow you to travel to other countries and carry your personal information just in case an emergency, like getting arrested or ticketed in a different country. The countries don't carry your information because your not a citizen there. Our county should have them because first, we are going to a completely different planet and need something to carry our personal information. If we disappear on the planet, our peers will know everything about us that might help find them. That is why we will need passports on mars and they are very important in general too. This is our flag would look without the triangle cut out. If you click on the flag it will take you to the flag making website. 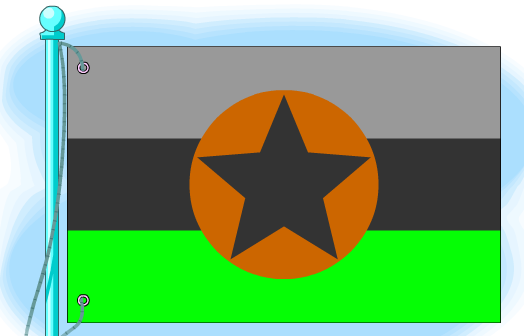 The flag we finally decided on making is the independent flag because each color/part represents a different part of our independence. There also many other different aspects to our flag as well. Each color and shape represents a different thing, here is what they represent. The star represents all of the stars in space, as that we are not on earth anymore. The dark orange outline of the star represents Mars. The dark grey stripe represents our absence from Earth. The very light grey represents courage and strength. The neon green represents that we will live on Mars. The triangle cut out shows that we don't have to follow Earth's rules anymore. 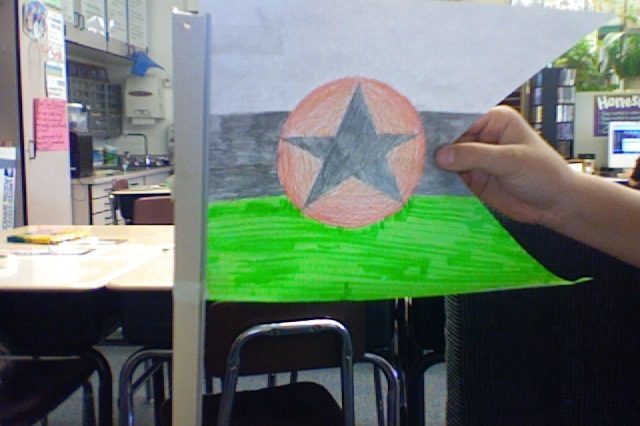 We started by looking at other flags of different countries. We got some good ideas from looking at google images. Then we started playing around with create a flag. We then decided on not having a rectangular flag. We decided that we would do a flag that has a triangle cut in the side of it. The flag has four different colors and each one represents a different thing. The flag is very important to mars because we need something to represent us. To decide on what motto we used, we made a list of about 10 motto's, we trimmed the list down to five, then we made a poll of the five that we trimmed it down to. The class and us voted on what motto we should use for our mission to mars. 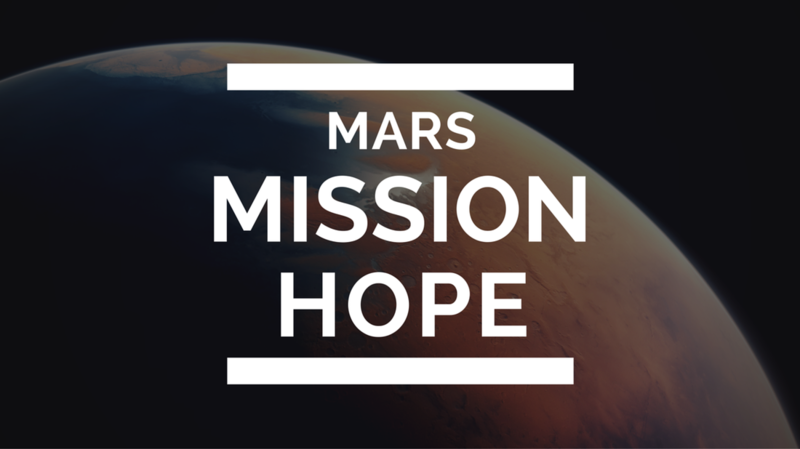 The results showed that our motto would be Mars, Mission, Hope. We also put the results on the whiteboard to show the class what the results were. Everybody voted for there own opinions. The website we used was Polleverywhere.com. It worked pretty well and significantly easy. THIS IS THE NATIONAL PLANT FOR MARS. THIS PLANT IS A GLOWING DAHLIA. THE GLOWING DAHLIA MEANS INNER STRENGTH, WHICH IS EXACTLY WHAT WE NEED FOR MARS! THIS IS OUR NATIONAL ANIMAL IS A HEDGEHOG. HEDGEHOG MEANS: YOU ARE UNIQUE AND,IF THAT IS NOT FULFILLED,THEN SOMETHING HAS BEEN LOST.